Many of us rely on our smartphones for all our media needs. Now more than ever, we're using Bluetooth connections to play audio over speakers, headphones, car sound systems — the list goes on. If you own a Samsung smartphone like the Galaxy S9, there are a number of Bluetooth tweaks and hidden tricks that can maximize your audio experience. Most of these Bluetooth enhancements aren't enabled by default, so you'll have to get into your phone's settings to enable the features. Fortunately, the settings are relatively easy to access for the most part. We'll highlight the best ones below to help you get the most out of your Galaxy's Bluetooth feature. Thanks to the revamped Quick Settings menu that arrived with Android Nougat, accessing Bluetooth settings on your Galaxy has never been easier. You're probably aware that tapping the Bluetooth icon here will quickly enable or disable the feature, but there are two other ways to interact with this toggle. If you tap the word "Bluetooth" underneath the icon, the Quick Settings page will turn into a mini-menu where you can easily connect to Bluetooth devices. If you long-press the Bluetooth icon, on the other hand, you'll quickly jump to the full Bluetooth menu in your phone's settings, where you can perform a range of actions from pairing to adjusting existing Bluetooth connections. Though the Bluetooth Quick Settings tile is featured front and center within the menu itself, you have the added option of moving it to a more ideal location more tailored to your needs. To move the Quick Settings tile, swipe down twice from the top edge of your screen to fully reveal Quick Settings, then tap on the menu button next to the settings cog and select "Button Order" from the popup. From there, simply drag and drop the Bluetooth Quick Settings tile to your preferred location within the menu, then tap on "Done" to confirm and exit. Media Volume Sync is an ingenious little setting found within your Galaxy device that lets you control the volume for your Bluetooth speaker or headphones straight from your phone, and vice versa. This not only ensures that your paired devices stay on the same page as far as audio output goes, it also gives you the added ability to use one device to control volume whenever one is out of reach. Without this setting enabled, the volume buttons on your headphones will turn your headphones up or down, but the volume level of your phone's Bluetooth output will remain the same. This is particularly annoying when your phone is set to a low volume, because the headphone volume will never go high enough unless you raise the volume on your phone as well. 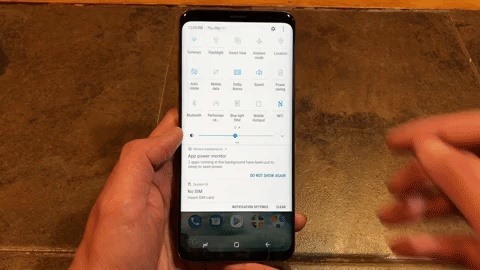 To enable this feature, pull up the Quick Settings menu on your Galaxy phone and long press on the Bluetooth icon to go to its settings page. Now, tap on the three-dot menu button and select "Media Volume Sync" from the popup. From there, simply hit the toggle close to the top of the page to turn the feature on. Note that your Bluetooth speaker or headphones must also support Media Volume Sync in order for the feature to work. It's very simple to check for this — tap on the toggle as highlighted above, and if your headphones are incompatible, the toggle will automatically switch back off and inform you via prompt. One of the biggest hassles you'll encounter while enjoying media on your Bluetooth headphones or speakers is the audio interruptions from other apps. Every time you get a notification, the music becomes almost inaudible for a few seconds. Thankfully, your Galaxy phone has you covered — it lets you isolate an app from all the others and play its audio exclusively over your Bluetooth speakers. It's really an ingenious setting. The gist is that, while you're connected to Bluetooth speakers or headphones, only sound from one particular app will play over Bluetooth. The rest of your phone's audio will keep coming out of the built-in speakers as usual. To try it out, head to your phone's settings and tap on "Sounds and Vibration." Here, you'll find the setting — aptly named Separate App Sound. Select this option, then tap on the toggle once you're in that page to turn the feature on. Tap on "Select" from the prompt that appears to finalize your selection. It's now time to select which app you wish to play over your Bluetooth device, so either tap on the target app, or "Add application" to manually add it on, then select "Bluetooth device" to designate the app to your speaker or headphones. This is a great workaround for those notification interruptions I mentioned. All you have to do is select your favorite music app, then any sounds that your other apps make will come out of your device's speaker instead of interrupting the Bluetooth stream. If you have two speakers that you'd like to pair to your Galaxy device and further boost the audio output within your home, you'll want to enable the Dual Audio setting within your phone to connect to another speaker or headphones. Note that Dual Audio requires a Galaxy model that supports Bluetooth 5 or higher, so that means you'll need a Galaxy S8, Galaxy Note 8, or newer model. To try it out, head to the Bluetooth menu in Settings, then tap on the three-dot menu button and select "Dual audio." Now, tap on the toggle along the top of the "Dual Audio" page to turn the feature on. If you have Media volume sync enabled, a prompt will notify you that the feature must be disabled for dual pairing to work, so tap "Turn Off" to disable it. Once done, you're free to pair a second headset or speaker to your Galaxy device. It's worth noting that audio output for two Bluetooth devices may not play in perfect sync, depending on their Bluetooth versions. For instance, one speaker may slightly lag behind another if one speaker is on Bluetooth 4.1, while another is on 5. This minor discrepancy may not matter much if you have the speakers in separate rooms. Nevertheless, it's still worth some consideration. If your Galaxy device is running Android Oreo, it now features multiple audio codecs that you can choose from to enhance your experience when using Bluetooth headphones. In a nutshell, codecs are used to compress digital audio streams, similar to ZIP files. By default, the Galaxy uses a generic Bluetooth codec, but some Bluetooth audio devices have more advanced codecs that enhance audio quality if your phone supports them. For instance, Sony's proprietary Bluetooth codec, LDAC, is considered to be one of the best codecs out there due to its support for high quality audio. However, it has limited hardware support, and isn't available on as many pairs of headphones and speakers as its more popular counterparts, SBC and Qualcomm's atpX. That said, the audio codec found on Oreo can be easily changed from the standard SBC to either AAC, aptX, Samsung HD, or LDAC. To try out a different codec, activate Developer Options on your device, tap on "Bluetooth Audio Codec," then choose a codec from the list. For more information, be sure to check out the following guide. Without a doubt, Galaxy smartphones will get more advanced and feature newer Bluetooth enhancements as future models roll out. As such, we'll be sure to keep this list up to date and add more tips as they surface. In the meantime, feel free to post your comments down below to let us know your favorite Bluetooth setting.